Is projection for dark rooms only? Most of us think projection screens can only be used in the dark spaces. Therefore our home needs a dedicated dark room for a home theatre, while businesses using projectors are bound to hold their meetings in the dark. We know projection and ambient light in the room do not go together well. Ultra-bright, ultra-short throw and ultra-expensive projectors can improve the situation, allowing using projection screens in ambient light conditions, but at what expense! That’s how it has always been – till the invention of ALR projection screens. ALR stands for ambient light rejection. It means the screen reflects the light coming to it from the projector back to the audience, while all other light is rejected (reflected in other directions). One of the characteristics of projection screens is gain, which is the ratio of light reflected back from the screen surface. ALR projection screens have high gain (more than 1), and therefore give the viewers brighter image. The bigger the gain, the brighter is the image. The biggest problem of ALR screens is a hot spot, which is simply the reflection of projector lens. Sometimes you don’t see a hot spot, but if you are looking at the screen and your eyes hurt, the screen is still hot-spotting. ALR projection screen with ultra-high gain and yet minimal hot spotting has been invented in Korea by MocomTech. Thanks to the specially designed, precise, lens-like curvature, this amazing screen delivers stunning image both in the dark and in the well-lit room. Mocom Solstice ALR projection screen is 18 times brighter than conventional matte white projection screens, without hot spotting. Mocom Solstice screens are characterized by high contrast and graduation. Moreover, they are ready to project not only ultra-high definition 4K video, but 8K and beyond. The screen delivers amazingly bright and sharp images with standard or long throw projector. 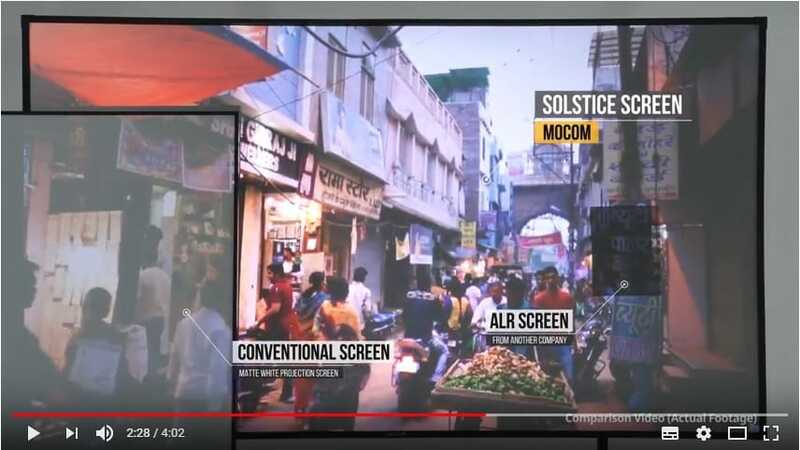 Moreover, Mocom Solstice outperforms other ALR projection screens, also providing outstanding performance in 3D images. You need to see it to believe it. Ultra-high gain ALR optical projection screen Solstice is a true miracle!